This entry was posted on	April 12, 2015 at 12:25 pm	and is filed under Uncategorized. How many people have gotten jailed? Really! A few were jailed in 2009. So the expected value is negative. Better not to play that game if you can avoid it. It always made me laugh that chavistas and more than one opposition people tried to pull on me the excuse that “you don’t have right to complain because shabbe-maburro subsidized your dollars!”. I never get tired of the face they do after hearing that, hahahah! Thank God there are still Dollars available to travel to Disney!!!!!!! Unfortunately Miguel I did not see your posting so rude against the more than 50 billions US$ bonds sold and paid at a very cheap exchange rate from 2005 to 2012.. why to pay OUTRAGEOUS COUPONS for these subsidized bonds? This was and IMHO still it is a subsidy to bond holders. I understand that most holders are Venezuelan related financial corps, many boliburgueois and just a few foreign HF and voltures. I think Santos and Hausmann discussed this point months ago with no bias. The coupons simply reflect the risk. The subisdy there was more to those that bought them cheaply. Few complained about how perverse that mechanism of selling dollars was (I did). 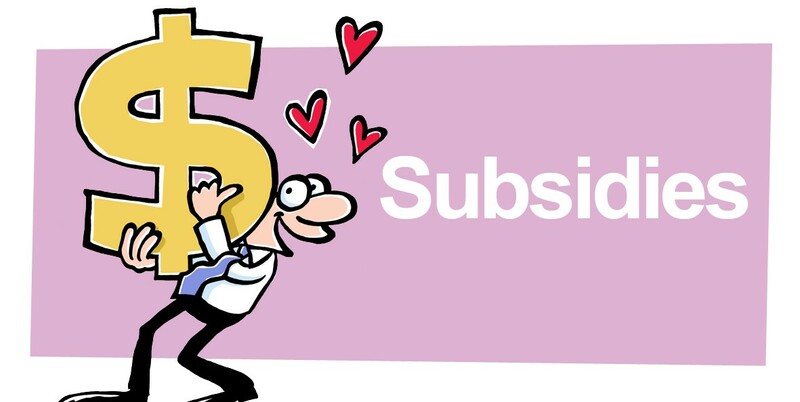 As to subisdy to investors, is it a subsidy? I dont know, they rea taking a lot of risk. I dont think those that are losing 50% consider it a subisdy. Of course you have to feel bad for those who can’t get the right medicine, or whose friends/family get killed for nothing. But cry me a freaking river already about al the whining about “escasez de alimentos” .. didn’t 9 Millions of Venezuelans just come back from an extended Vacation, spending left and right?! Somehow they have plenty of cash to pay even poorer people to stand in line for them or travel far away to get stuff, at any price. A good majority – not all but over 15 Million- of our populace, Corrupt, Flojos, Enchufados are reaping exactly what they have sowed. They wanted a Gibielno Populal pal Pueblo? They’ve got it! And apparently, for a large part, Sarne con gusto no pica. Hasta que tengan Hambre de verdad. And that’s what’s coming. No, 9 million didn’t just go on holiday. You fell for exactly the propaganda that they wanted you to. Those numbers were a huge lie to keep people from complaining. If you would just do a little research you would see through the sham. Izarra was reporting one thing while the tourist bureaus & governors were reporting the exact opposite. Here in Margarita SS was a disaster with only 50 to 60% occupation. In Miranda Izarra reported a 70% increase while Capriles reported a 30% decrease. Ok. Thanks for the correction, You’re probably right. Still lots of “poor” amas de casa seem to have way too much Cash to spend, hire people to do the queues,.. puro Guiso. Where is “el guiso” in hiring someone to queue for you? It is an inefficient, sad reality we are experiencing as a society. Yes it shows all the elements of a persverse system. However it is not a guiso. Given the circumstances someone, willing to pay for having someone else queueing for him, more than likely is optimizing his resources ( time and money) in the most economically eficient way. I support that. A separate issue it is the reason for which we reached this point. Needless to say, it is pretty bad spot to be in. Hago cola 10 Dolal por hora y me quedo con 1 pollo. Well, wait a while and you will see. If you think those 1,500 enchufados going to Panama make a difference in the scale of things, then you are more out of touch that I believed people were. What you do not understand my friend is that it is all a matter of perception. In times of necessity people are expected to pull together such as your post implies. Many times they do pull together such as Great Britain in the second world war and sometimes they wont such as in the calamity that is about to hit Venezuela. People who have felt wronged by the pajarito and his heir simply wont help. You reap what you sow. It is not perception, the reality is that if we whine about what is not right, instead of complaining about what should not be done, we do not help our own cause of having a better country. The heir will remain in place if all the opposition does is complain about its own subsidies and perks. If the opposition does not have a discourse that is educational to the whole country about what should or not be done, then the best strategy is to just give up. If we accept controls but complain about quotas, then its a lost cause. You have to pick your fights. Is it so hard to understand that THERE IS NO MONEY? Is it so hard to understand that the deficit is about “only” US$ 25 billion. There are no savings, there is no money….but people want 3,000 to travel. Sure, makes a lot of sense. No money? And yet the government can send 1,500 parasites to Panama to disturb the peace on public account. Empathy? Gimme a break. The day the enchufados themselves will have to stay in the country then we will know THERE IS NO MONEY. Meanwhile the attitude of the government only shows there is less money than there used to be. On an empathy scale, Milton above beats the writer of this post by a mile. I think people do understand that there isn’t much money left and know how much those 1500 people represent in terms of $’s. But when this thing happens the same week that the new law is announced and when the people traveling to Panama, all expenses paid plus an extra $400 for “chucheria” and they start twitting pictures of themselves on a shopping spree; people feel that they’re rubbing it on their faces When the government refuses to investigate alleged cases of money laundering in Andorra, etc. ; people feel frustrated. Every time Maduro travels overseas he takes with him so many people, rents complete hotels and spends tons of money in expensive dinners for the government people, their family and friends — then it is difficult for those who stay behind to be rational and/or to believe the coffers are really empty. Well, that strategy will get us nowhere in the end, except the destruction of Venezuela. Agree with you Miguel. It’s just that the frustration and helplessness has reached such a high level that nothing seems to make sense any more. You can’t imagine how depressing and stressful it is to live here now compared to when you had just left. Nothing people tell you or that you experience in a short trip will help you understand how bad things really are. So I guess depression and stress do affect one’s capacity to be rational. I don’t think thats a valid argument. You really think these savings gonna be used in a good way? Most of it gonna be stolen by these corrupt and greedy chavistas/maduristas anyways. Everyone already expects that! Clearly there is no trust at all in this government anymore… And THAT’S WHY people don’t accept it and GO CRAZY!!! Sad but True! I have been following the plight of Venezuela since 2003, and the one thing that stands out is: Nothing is going to change because the citizens of the country are dependent on the government, exactly what Chavez wanted. There is no fight in their blood. Where’s the bolichico empathy here? The sooner the subsidies dry up and the reality sets in, the sooner el pueblo will realize that to continue down this path is not sustainable. Brutal truth can be a bitter pill to swallow, but it may end up being the catalyst for change. Off topic, but it is interesting to watch how a little corruption within Petrobras (extremely minor by Venezuela and PDVSA’s standards) has Brasilians calling for Dilma’s impeachment. Venezuelan’s have become completely desensitized to government, and or PDVSA corruption. This type of news in Venezuela wouldn’t even rate conversation over a game of dominos. It is sad to see how far Venezuela has fallen, and question whether it can turn around after a generation of brainwashing. Empathy applies to everyone. The minimum salary at the Simadi rate is like $30 a month, this is like one sixth of that of Guatemala. Everyone is having a rough and hard time. We are talking about something which is more than a years salary for workers that deserve the same empathy. So do cancers patients. In the end, it is empathy for all Venezuelans, because they have never seen the magnitude of the current crisis and clearly, many do not understand the sacrifices ahead. Everyone having a rough time? Not so sure. Over 3 Million enchufados getting bribed for doing nothing by the Dictatorship, Plus many more millions getting Freebies left and right, apartments, free electricity, free land, plus the daily “Tigritos” y “segundas” y “palancas”, etc, etc. Somehow our poor populace seems to have plenty of cash, huh? 9 Million just came back from extended vacations.. the “poor” majority seems to have more than they’ve ever had, with all the bribes, all the corruption and theft going on. Somehow, the are in endless lines to Buy anything that’s left, and even pay others to do the lines, or send people to Caracas and other big cities to buy stuff, at any price, they speculate with it and resell..
And everyone stil LOVES Chavez, 25% still even supports Masburro.. amazing. Empathy? I’m starting to run out of it. We’re just corrupt and lazy to the bone. We may be getting what we deserve. Sarna con gusto no pica. Could not agree more Miguel, that is the point. Empathy to everyone. Especially to the poor, the middle class, salaried workers and of course cancer patientients to name a few. I would not dare to ask for emapthy to the middle class alone. Less judging others and more educating. Less cinisism and more proactiveness. Best idea is to redirect the bitterness towards the goverment and take it away from the middle or poor venezuelan class. Most Venezuelans are in the same boat. I think the key here is about being more empathetic. There are tons of economic efficiency arguments and moral reasons to support eliminating the subsidies. No doubt about that. Subsidies and quota must disappear!!! However, we must understand where the middle class despair is coming from. To illustrate the point, let us use a typical 55 year old venezuelan middle class male, with no governmental ties at all. Let us say he is one of the angry venezuelan complainer for the recent and traveller quota measures. Now let us see where this guy is coming from. This is a guy that has probably seen a son or two emigrating to find a decent future outside Venezuela. This is a guy who has probably lost a friend or relative to the hands of violence in Venezuela. This is a guy who struggles everyday to find food in the supermarket. This is a guy that sees his income diminished every single day thanks to the inflation in the country. This is a guy that has seen the civil liberties and rights disappear during the last 15 years. This is a guy that sees a government everyday taking measures to diminish his quality of life! Shouldn’t we expect this guy to have just a little bit of a gut reaction after the Government decides to lower his traveller quota. To me this is the most natural and human reaction to expect! I do not think it is about ” Touch anything, but don’t touch my subsidy! ” From the middle class point of view everything has been touched already anyways!! I know a lot of hard working people, honest to the bone, with no government ties at all, whose life will affected by these measures. I feel for them!!!!! I have seen posts here characterising the middle class as a bunch of rent seekers, uneducated, corrupt to the bone, lazy people. I could not disagree more with this statement. So sad to see the tone of this article as well. I repeat the argument is right no doubt about it. There is no right to receive subsidies. No right to a subsidied travel quota. Agreed!! However a bit more empathy to the people taking the hit should be granted. I lean towards educating the middle class about it not towards calling them “rent-seeking, self-serving and egoistical Citizens” . It is out of touch not understanding where they are coming from. Must of them are not “rent-seeking, self-serving and egoistical Citizens”, they are just having a gut reaction to another measure diminishing their quality of life. It is too harsh from my point of view to call them “rent-seeking, self-serving and egoistical Citizens” . As a matter of fact, I know that these people will gladly (actually in a split second) accept the measure if it were part of a larger set policies destined to free up the economy from government controls. Not to say if it were part of an even broader set of policies destined to return civil rights to the country. The point here is not whether the subsidies are right or wrong. They are absolutely, crystal clear wrong. The point here is about characterising, judging and in some cases (not this article for sure) making fun of the middle class stupidity for thinking they are entitled to the traveler quota. The middle class is going through a lot these days. Must of them, at least in my experience, are not “rent-seeking, self-serving and egoistical Citizens”. To the contrary!!! I see a bunch a hard working and caring people in the Venezuelan middle class. The least we should be is empathetic. They just need to be explained, they just need some reasons. They might have been educated in fields different from economics. There is not reason to assume they should automatically understand the measures.Their reaction is absolutely natural. They just need an explanation!!! A little less judging and little more education would make a huge difference to society. Bravo, Milton! I could not agree more with your opinion. The anger is about feeling our freedom of choice (of anything) beeing restricted more and more everyday. I’ve always thought that travelling subsidies are wrong, but not having the choice of buying your dollars at a logical rate, when and wherever you please, is a lot worse. I think this a great reply by Milton. No doubt we have to consider the circumstances of those ones affected. MOctavio seems to miss that. It is true that privileges and entitlements have to be eliminated totally if we are to get out of the hole where we are digging ourselves more and more, but the problem that causes real anger to the middle class is the fact that privileges are being cut for some, but not for the nomenclature running the country. Those ones don’t need to go through a lot of red tape to get $700 or $2000. They have an easier time to get much more. Not small amounts to visit Disney or Paris. We are talking about billions that have been siphoned out to accounts in Switzerland and the recently discovered ones in Andorra. At a time where every billion counts you feel angry if you are the only one being targeted to make the sacrifices. I bet today, in the middle of this crisis, corruption is rampant at the higher levels with every chavista in power trying to steal whatever they can to send to an overseas account, and be ready for when this government is over and they have to flee the country. I understand that perfectly, then dont whine about your subsidy, go out and help get rid of those people. Complaining about your own perk is not the solution, complain about the corruption, complain about censorship. If we all have privileges, we will never get out of where we are. Corruption is rampant at all levels, a large fraction of the middle class lives off subsidies and perks. Get mad about the right things, not the wrong things. I just dont see how one wrong justifies many others. I know you are right but I think we have to put things in context here. I think for the most part, not having Cadivi is like a death sentence, in a country where you earn not more than 100$ a month. At least for all the people in maybe my little circle, people from 25 to 35 years old, ex middle class and educated. For me, that means that I wont be able to see my parents in years. Its not only me, this is a tragedy. I think it is a little too harsh to call us rent seekers. Now, I am lucky, I could get out. But please, be a little more empathetic with that lost generation, that didnt get to have a future. Ni puedo sino solo llorar por aquellos que no podran salir del pais, por los que no pedimos este maldito gobierno. Que cadivi es parte del problema, SI. Lo sabemos. Nadie pidio la devaluacion exponencial del bolivar, y si, esa tarjeta con 2800$ era la tabla de salvacion para muchos en un pais que va en picada. MO is right. Venezuelans have been living under the false impression that chavismo would be livable, because each person was getting a little perk. But what you did is allow yourselves to be bribed with populist mumbo jumbo. Now you lost your freedom, and your shirts. Welcome to the club. You haven’t descended into the hell the Castros have prepared for you. The point is that you have no right o a travel quota which is subsidized, you have a right to buy dollars freely in a market which does not exist. People have to fight for what is right, the travel subsidy is not right, because you get more out of it than a poor person from all its benefits from the Government, it is pan para hoy, hambre para mañana. Taking the other side of this argument, and being somewhat empathetic to the people living in Venezuela, the travel subsidy was truly the only equal subsidy provided by the state meaning anyone had access to it. Hence the outrage, the majority of the population do not get access to much other than high inflation and subpar living standards. So this has become their one relevant benefit. Miguel, the problem is not the quota traveler, this a problem of economic freedom, and human right which has been plundered by a fascist government, which does not let you do with your money, what you want, buy what you want or change your Bolivares to a hard currency, either Dollars or Euros, by the system that is, SICAD or SIAMDI, all this is intended submission of a ingnorante people, a government remains in power, he did Corruption of his life. We are clear that these subsidies: Food, Travel, Remittances and Gasoline, are an aberration, but not deleted because the Nomenclature lives of them, based on the smuggling of subsidized gasoline and almentos extraction, and other foods to buy and on billing products and companies briefcase, and who are those who control the borders? Since the Nomenclature lives income of $ subsidized to the people the only thing I had was quota traveler, proteguer their savings, or other option had ?, to protect against the depreciation of Bolivar? Corruptzuela’s corruption knows no limits. Like a contagious pandemic is has metastasized down to every level of our society of corrupt Enchufados. From the campesinos, to the obreros and their putrid unions, to whatever’s left of what used to be a “middle-class”, to the 3 Million leeches working for dictatorship. It’s all about “regalitos, ‘cuanto’hay’pa eso, “una segunda ahi, chamo, resulevete ahi, pana.., everywhere. There may be “escasez” and insecurity, but our corrupt populace seems to have plenty of cash to buy anything left, at any price, don’t they..
To that extent, we are getting what we deserve. We’re just a bunch of uneducated, lazy and corrupt-to-the-bone “rent-seekers” indeed. Ademas, Sarna con gusto no pica. I think the larger allowance for Europe is caused by the number of Chavistas trying to get their cash from the usa to Europe. Whatever the cause, we see them over here spending lots of money. They also go visit a bank owned by Banesco. One of the branches in Madrid has lots of chavista accounts. Great post. I was rather surprised by the breadth of reaction to this on my facebook feed. I love the puzzled reaction folks here in the states get when I explain to them the whole travel subsidy situation in general. I think it encapsulates some of the unsustainable and irrational insanity of this supposed ‘revolution’. If are going to touch mine, please touch both, yours and mine! that is one rent seeker claim for other to be there, the apportion should be even, otherwise you are slip up with some moral relativism, too common these days. Subsidies are the most demanded rent seeker behavior in countries like Venezuela where the main rent source is something which has property rights defined a Treasure doors. Corruption, wide considered, is the worst, morally speaking, rent seeking behavior in here, and there, it causes the same effects as subsidies, say gas, or dollars viajeros, in general, although there are some specifics, but I do not have time for that right now. Let is put this way, bond holders of high Venezuelan yield -risk takers- are somehow subsidized as well, this time indirectly, someone at the other side has to arbitrage it. There are many examples, let take this “neutral”; for example, Dominican R pays today value what had double in nominal values. The have such 50% discount when pay today. Across the board, everybody, anyone which has some kind agreement with Venezuelan government, estate company, will demand the fair as well as develop some particularly rent seeking incentive as some costs –not sinked- but transaction ones lies behind it. It looks that overall economic system, in infected for that outfall behavior. So, there are many rent seekers -you and me- invited to the party, everyone want to be there and take something; or you release all these controls, liberate the economics righty’s, enhance the protection of property rights, and procure the justice of everyone even facing the law, and leave the market to do what it’s know very well to do, or we are going g to have a big fight to get something even though the party c”est fini!!. Well I am convinced after expending two years learning about PDVSA’ s KPMG financial statements from 2004 to 2013, an looking at no-balances of all so nicely called – empty- “sovereign funds”, and after counting the “assets” which government would “liquidate” when needed, the partition of the cake would exacerbate passions. For the time being, I do prefer that all subsidies were removed for everyone at once that is even, the rest is pure mogigateria and moral relativism, to use a nicer word. It shows that chavistas are not the only ones blinded to the absurdity of this atrocious government. Your are right Maria, everyone, listen, everyone, with some kind of demand for any government circumstance in on the line, it does not matter is for toilet paper or for a flight ticket. Venezuela is the extreme of a rent seeking society, every one suspects of his neighborhood, with a lot of …….